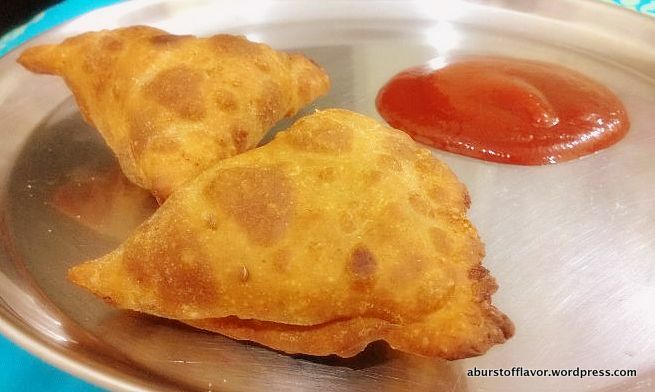 Samosa is a widely loved evening snack item. It is very versatile in the sense that a wide variety of fillings can be substituted for the usual Potato – like mushrooms and peas, mixed vegetable, paneer, spinach, onions etc – so you never get tired of eating it 😉 But I wanted to play safe and start with a simple filling since it was my first time making these from scratch. 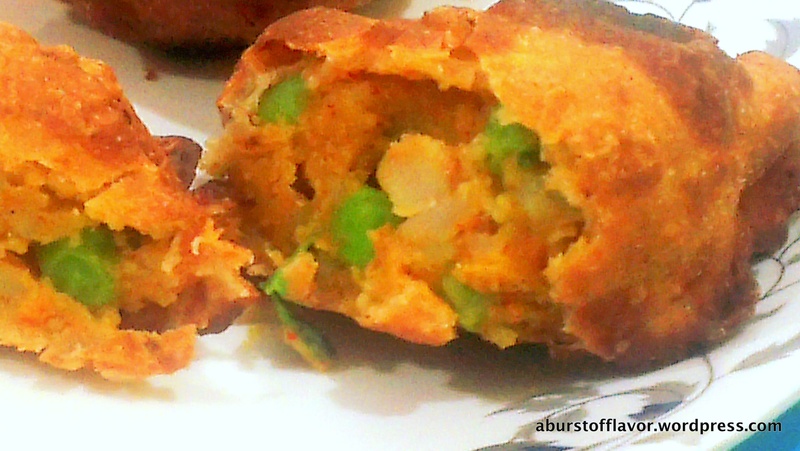 Hence the potato and peas samosa. 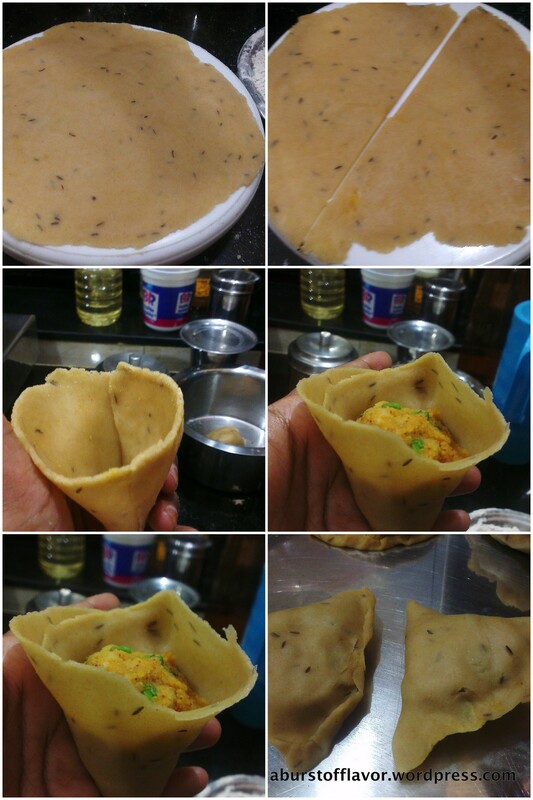 A google search later, I zeroed in on one particular recipe at Uma’s Culinary world which has a neat recipe on making these samosas with whole wheat flour, which is a healthier alternative to maida. Read on for the recipe! Recipe adapted from Uma’s Culinary world. 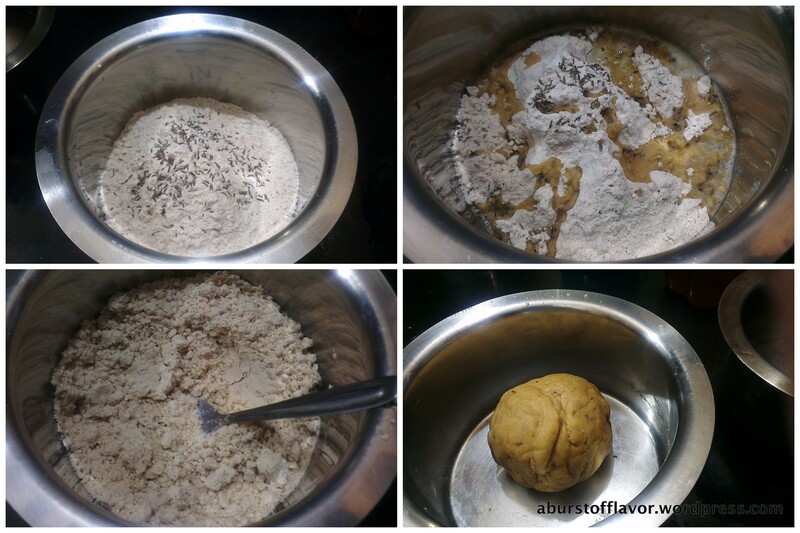 In a mixing bowl, add the flour, jeera and salt. Keep aside. Heat the ghee and oil together in a pan for a minute or so, switch off the flame and pour the hot oil into the flour. With the help of a spoon, mix the oil with the flour nicely so that all the flour is coated with fat evenly. Do this by pressing the back of the spoon against the flour and smoothening out any lumps. This step is very important to ensure crisp samosas. Once all the fat is incorporated into the flour and it is sufficiently cool to handle, add water and work this into a soft but firm dough. Take care not to add too much water. Cover the dough, set aside and let it rest for 15 minutes. Boil and peel the potatoes. Boil the peas. Put them in a mixing bowl. 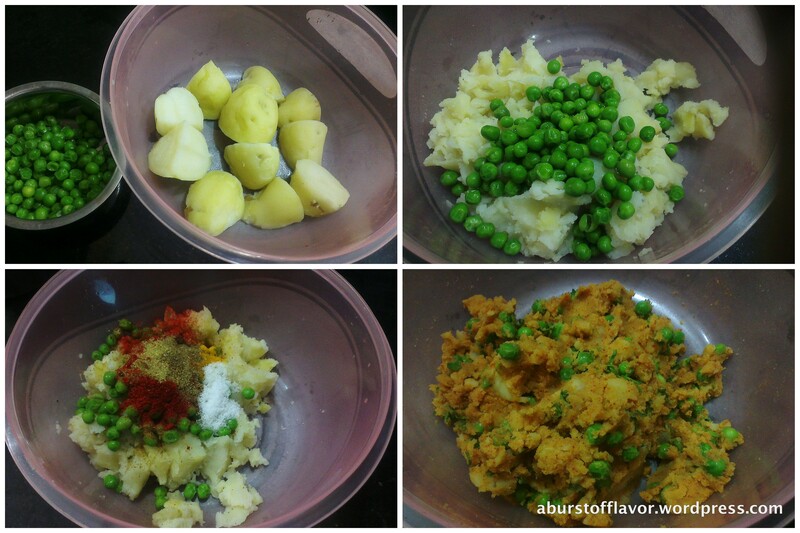 Mash the potatoes and incorporate the peas by hand. Add all the spices, salt, sugar, coriander and lemon juice and mix well. Divide the dough into medium-sized balls. Roll each ball into a flat circle. Make it as thin as possible, but not so thin because you don’t want the stuffing to tear the dough. Cut the circle into two semi-circles or half-moons using a knife. Roll up one semi-crcle of dough into a cone. Drop the filling into the cone. The cone should be 3/4 full, leaving some dough at the end for you to seal the cone. Once filled, seal the edges of the cone by pinching together the open sides of the cone. Some suggest that a paste of milk and flour can be made and used as glue for this sealing process. I found that I was able to seal my cones just by pinching the edges together firmly. Heat oil in a wide bottomed pan on a medium flame. 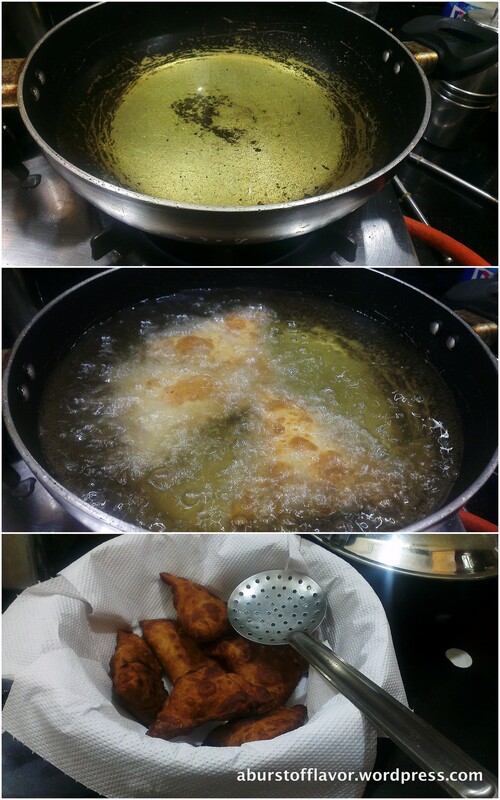 Once the oil is hot, drop the samosas in oil and fry on medium flame until golden brown. Transfer to a container lined with tissue to soak up the excess oil. I found that the best way to eat samosas is while it is just hot and not too hot. This ensures the samosas are crisp and the filling doesn’t burn your tongue 😀 I find that when you leave samosas to cool down, they do lose some of the crispiness. So I served the samosas hot with a side of ketchup to a husband who grinned and said he ate the same Samosas at office that day. Damp squib However, he was happy to devour three of these 😀 Verdict was that they were tasty but the shells need to be slightly thinner. Enjoy making & eating these – let me know how that pans out! !